Academics, journalists, comedians and musicians will be gathering at California State University, Northridge’s Valley Performing Arts Center on Thursday, Dec. 1, to draw attention to human rights violations taking place in Iran. “Striving for Human Rights in Iran” is scheduled to begin at 7:30 p.m. in the Grand Hall of the Valley Performing Arts Center, located at the southern end of the campus at 18111 Nordhoff St. in Northridge. The event is free and open to the public. Over the years, governmental and humanitarian organizations around the world have documented the persecution of journalists, filmmakers, educators and women’s rights advocates in Iran, as well as the persecution of people for their religious beliefs. Tohidi, an internationally recognized Middle East scholar, noted that the current president of Iran, Hassan Rouhani, has tried to take some steps to improve human rights for certain segments of Iranian society, but has been met with entrenched resistance from the country’s religious hardliners. She said one of the goals of the Dec. 1 event is to shine an international spotlight on what is happening in the country. 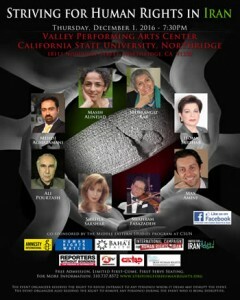 The evening will include performances by singer and songwriter Shahla Sarshar and acclaimed violinist Shahram Fasazadeh, as well as presentations by journalist Masih Alinejad; attorney, writer and activist Mehrangiz Kar, who is a visiting scholar/faculty at CSUN this academic year; journalist and sociologist Mehdi Aghazamani; comedian Max Amini; and actor and comedian Ali Pourtash. Journalist Homa Sarshar will serve as the night’s moderator. For more information about the event, visit its website at http://www.strivingforhumanrights.org/#.